Practice, practice, practice… This is what I remind my kids to do if they wish to get better at something. It’s about developing grit. Type of ingredients, proportion, oven temperature, height of tray, length of time, how to cool down, etc. The kids watch me practise week after week and they experience the improvements through tasting the outcome. 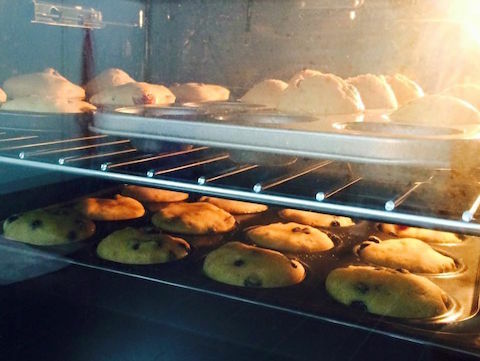 So when they hit an obstacle during their learning journey (be it Shichida, Montessori, music or something else), I can relate this muffin-baking analogy to them and they can “get it”. Of course you don’t need to bake muffins. Just engage in an activity that shows your child you’re practising hard to achieve a learning goal and display the never-say-die attitude. They learn more from our actions than our words. Another way is to use their past successes to remind them how practising has helped them to improve and achieve their learning goals. Learning will only get more challenging with age, so let’s keep encouraging our little ones that practice makes perfect. very good example and idea! thanks mV! Next post: Toddler sand play, cutting, etc.